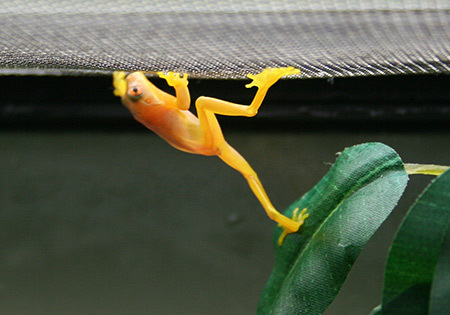 New pet frogs – 2 Red-eyed Tree Frog morphs added to my frog collection. The following pics were taken 1 week after purchase. 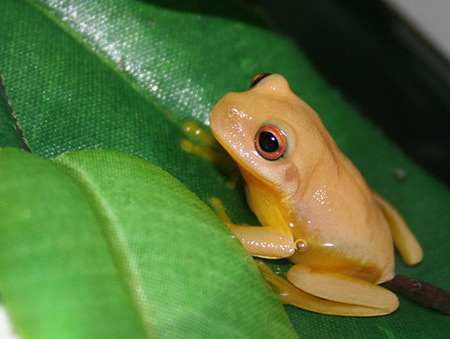 The frogs are still yellow and translucent but are beginning to show more green colouring. Hi I am a kindy teacher and we have been raising frogs from tadpoles. it is great to see that they look translucent before they turn green. We do how ever have on that is all ready green with the red eyes. I would like to know how many things we can feed them and where to get it. I usually stick to crickets which I buy from the local pet store. The crickets come in 4 sizes – pin head or baby crickets, small, medium and large. I have also used house flies and moths. All food must be alive. New morphs usually need pin head crickets and should alway have food available to them. 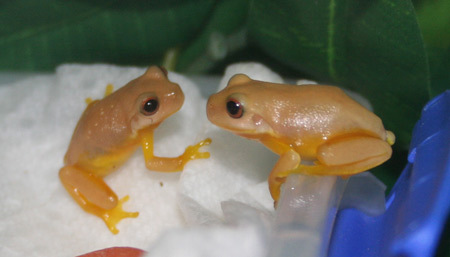 Full grown frogs can be feed every other day or so. Could you please tell me how long does it take them to change to the darker green? Hi Corrin, I think it was a few months. As their size increased so did the colour.